Today we shot some portraits for Zander Bleck, who is both a model as well as a singer-songwriter. As most of the recent photos are very rock-&-roll we decided to go for a fairy tale theme and a more natural-lit look to bring out Zander's soul in a different way. The setup for "The Lonely Prince"
Flour and water are two of the most common ingredients in human sustenance. The cultivation of crops like wheat changed everything and launched the world into an agricultural revolution, causing the first exponential rise in the human population. Today I’m going to show you how to make the perfect scallion pancakes also known as green onion pancakes. It’s a simple dish with very few ingredients but quite difficult to get just right. The perfect scallion pancakes should, on the outside, have a golden brown crispy texture and, on the inside, have fluffy layers bursting with savory goodness. 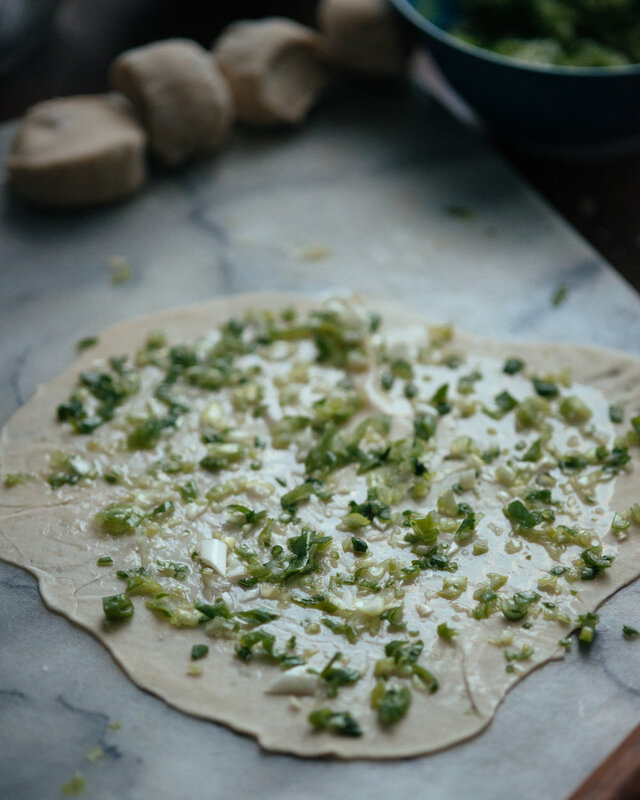 The dough is the most important part of a scallion pancake and is usually what makes or breaks it. You have to use hot boiling water in order to get the right amount of fluffiness. If you use cold water the texture will end up very bouncy and be tougher to chew, some people use egg to counter this but we can achieve the perfect texture with just flour and water. Mix in the hot water gradually water until the loose flour starts to form chunks, but without letting them get too muddy. Fold the chunks together carefully, as they will be pretty hot. Sprinkle dry flour as needed to keep the dough just shy of being too sticky to work with. The closer you can keep the dough to this consistency, the thinner you’ll be able to get the layers and the more delicate the texture will be. Knead the dough 100 times, or for at least 15 minutes. Cover the dough a damp towel and let it rest for at least an hour. Make sure you have a lot of scallions as they will run out quite fast if you are putting enough into each cake. I usually split them down the middle before chopping as this way I won't get those circles that tend to bounce around. Mince the scallions as small as you can. Larger chunks will give you pockets of moisture as well as points that can burn unevenly when frying. Split the dough into pieces and flatten them as close to paper thin as you can. The thinner you can get it, the more fine your layers will be. Spread oil - lard is used, traditionally - evenly, sprinkle salt, and put a generous amount of scallions. Don't be stingy with the scallions. Roll it up and then form sort of a "snail" or "cinnamon bun", tucking the tail underneath. Flatten this into a circle and it is ready. Ideally, the cakes are around a quarter inch thick. This is the easy part. Fry in a pan with oil until golden brown on both sides. Cut into pieces and serve.